Ceilings soar to a dramatic 15 1/2 feet in the ballroom at the home of Dr. Al and Joan Sheen on Jackson Avenue, where paint was carefully restored to its brilliant, original pink, green and gold. The house, designed by renowned architect Henry Howard, will be featured on the Spring Fiesta tour this weekend. This double-gallery home on Jackson Avenue will be featured in the Spring Fiesta home tour March 29-30. Dr. Alan and Joan Sheen have collected antiques to furnish their historic mansion on Jackson Avenue, including the piano, harp and seating in the parlor. An antique couch, bottom, is placed in front of the hand-painted wall at the Sheen home. Venetian glass chandeliers light the ballroom, surrounded by plaster crown moulding and ceiling medallions in vivid hues and intricate patterns. The original springlike palette of pink and green brightens the drawing room. A small hand painted vignette decorates the top of an original fireplace at the Sheen home, featured in the Spring Fiesta home tour this weekend. Figurines decorate a shelf at the home of Dr. Alan and Joan Sheen. An untouched vignette, original to the house, is seen on the ceiling. Pink, green and metallic hues are traced into the details of a plaster medallion surrounding a chandelier at the Sheen home. Painstakingly collected period accessories, such as this silver teaset, fill the Sheen home. The Sheens have restored and refurnished their Jackson Avenue home with original accessories, such as this knife holder. A piano in the ballroom has its original ivory keys. A former owner hosted cultural events in the home. The original Alhambra fountain, designed by a turn-of-the-20th-century owner, was dug up in the Sheen garden after a former resident stopped by, asking about the home's gardens. Native Louisiana plants flourish in an original two-tiered pond, excavated from the backyard and restored after research with the School of Landscape Architecture at Louisiana State University in Baton Rouge. Pansies are reflected in a pond outside the Sheens' home. The home of Dr. Alan Sheen and Joan Sheen photographed in New Orleans, Tuesday, March 26, 2019. The historic home will be featured in the Spring Fiesta home tour March 29-30. This room overlooking the gardens was once an aviary, the Sheens said. Wainscoting with a dark green faux-marbre (marble-look) finish follows the staircase upward in the Sheen home. But the bright and colorful interior of the residence — known as the Goldsmith-Godchaux house on the National Register of Historic Places — will elicit awe when Al and Joan Sheen open their doors for the Uptown Spring Fiesta tour Saturday, March 30 (1 p.m. to 4 p.m., springfiestanola.org). That’s because Al Sheen, well before he and Joan married, hired a team of paint conservators to undertake the painstaking work of determining the original colors in the house by peeling back paint layers, one at a time, to uncover the original. In the entry hallway, where a stair with a Cuban mahogany newel post leads upward, they uncovered faux marbre (marble-look) wainscoting in dark green, with pale green walls and pink stripes. In the formal dining rooms, their work revealed spring green walls set off by vertical strips and cypress wainscoting painted in a faux bois, or wood grain, pattern. Shading on the stripes creates the illusion of being three-dimensional, as if there were moulding applied to the walls. The piece de resistance is the ballroom, an immense double parlor to the left of the entry, where the doors, walls and ceilings, along with plaster crown moulding and ceiling medallions, are all painted in vivid hues and intricate patterns. “I suspect, but have not been able to prove, that the small paintings inset in the ceiling frescoes were painted by Dominique Canova,” Joan Sheen said, referring to the Milan-born artist known for his decorative work at St. Alphonsus Church on Constance Street in the Lower Garden District. As the sign in front of the house observes, the home has "more fresco wall decoration and stenciling than probably any other mid-nineteenth century residence in the South." 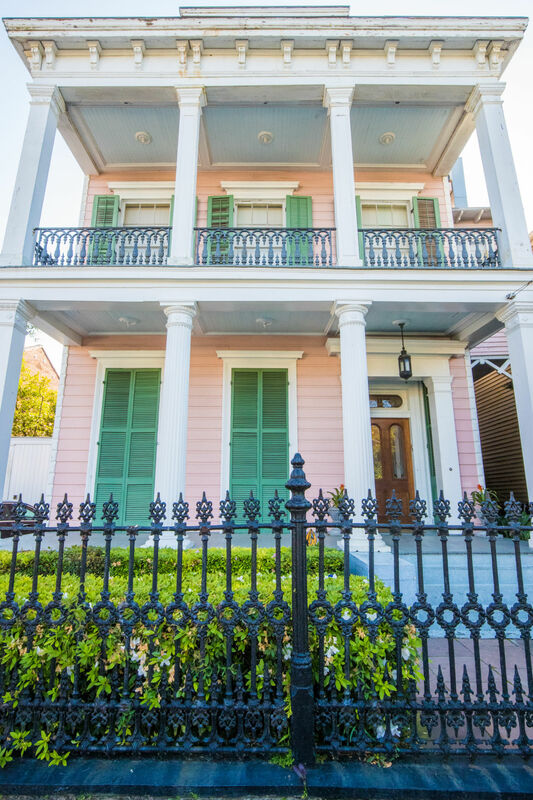 The house was designed by renowned architect Henry Howard, who designed Madewood in Napoleonville, the Carrollton Courthouse, and the “cornstalk fence house” in the Garden District, among others. Another revelation in the history of the Sheen’s home came with a knock on the door one weekend afternoon back in the 1990s. But the query initiated another round of research and consultation, this time with the School of Landscape Architecture at LSU. The Sheens learned that David Fischer, who owned the house at the turn of the 20th century, had designed and installed the gardens. An excavation revealed a long, narrow Alhambra-style fountain and a two-tiered pond, per the original drawings. “The plans called for Louisiana native plants surrounding the pond, so that's what we put in,” Joan Sheen said. Over 30-plus years, the Sheens have collected antique furniture for every room, including the ballroom. Venetian glass chandeliers light the space, and marble mantels and soaring 15 1/2-foot ceilings add to the drama. A gilded music stand and Erhard piano, made in England in 1810, are testament to yet another era of the home’s past when an owner was a ‘music impresario,” as described by Joan Sheen. As desirable as the property is today, the 12,000-square-foot mansion was far less so when Al Sheen acquired it in 1975.